Tibaldi was founded in 1916 and closed doors in 1960. Somewhere in its middle years, this 1935 Model 0111 Doctor fountain pen was produced. 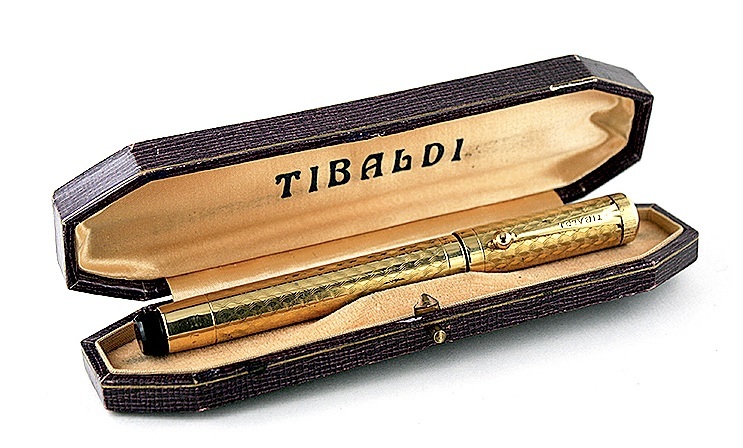 This vintage pen is one of the rarest Tibaldi pens, with only two known to exist. This model is an eyedropper-filler with a wave-chased rolled-gold (gold-filled) overlay on a black hard rubber body. The nib is a fine, flexible Tibaldi 14CT 7. In addition, the barrel contained a thermometer! This specimen was sold in Catalog #71. Subscribe to future catalogs so you won’t miss out on other great, rare pens! This entry was posted in Vintage Pens and tagged Extraordinary Pens, Tibaldi. Bookmark the permalink. Follow any comments here with the RSS feed for this post. Post a comment or leave a trackback: Trackback URL.